Formed in 1997 and registered as Red Code Footwear Sdn. Bhd. on the 5th March, the company is then registered as SOS Concept Sdn. Bhd. on November of 2007. 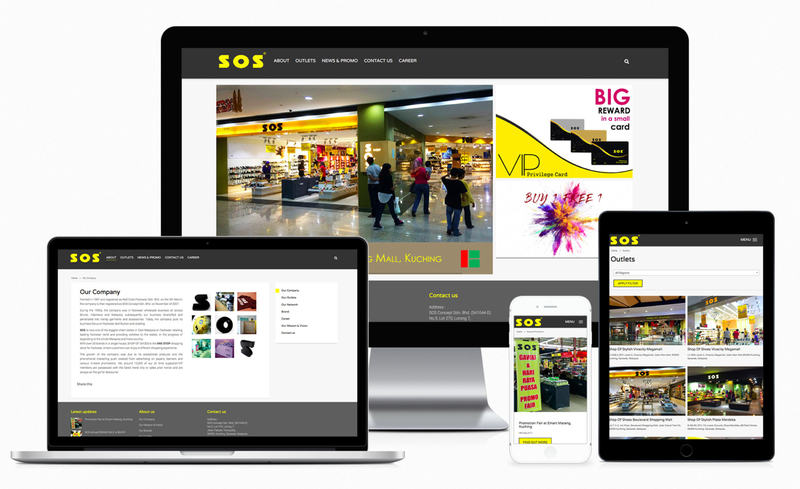 SOS is now one of the biggest chain stores in East Malaysia on footwear retailing, leading footwear trend and providing varieties to the states. In the progress of expanding to the whole Malaysia and more country. With over 25 brands in a single house, SHOP OF SHOES is the ONE STOP shopping store for footwear, where customers can enjoy a different shopping experience. Design and build the website with modern design, responsive layout, and easy to use backend system that is friendly for end-user. With our “Dynamic Content Modules” that is easily to use to manage their content without a programming knowledge, and make the product listing to be e-commerce ready when they are ready to sell later. Dynamic Content Block by HDS, easily to manage the content with dynamic modules that able to add into any pages, post etc. Things like tabs, accordion, photo gallery, grid items, banners, parallax image, video etc. Are so easy to add and manage now, and they are responsive design, which fit perfectly into any screen size of the devices. SEO friendly, Optimised for fast loading, compatible with iPad/iPhone/Androids tablet etc. and different kind of modern web browsers. Easy to expand and add-on more modules in future. e-Commerce ready, when client insert their price, shipping info, with the payment gateway, they are ready to sell their products online.